White Room + Children + Dots = Art! What do you get when you start with a white room and then give thousands of children coloured dot stickers? That is exactly what artist Yayoi Kusama wanted to find out. 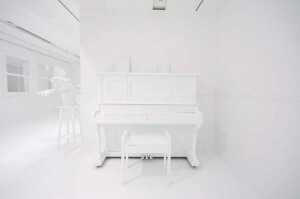 She painted a room in the Brisbane Gallery of Modern Art completely white. The walls, floor and ceiling were white. The piano was white. The couch, TV and seats were white. Even a fern was painted white. And then she invited thousands of children inside. Each child was given lots of coloured dot stickers. It wasn’t long before the white room became a festival of colour! Kusama has been working with dots in her artwork since the 1960s. She had daydreams of “repeating patterns” when she was a child. The dots in her artwork are like those daydreams. They are “repeating patterns” of circles. Kusama used the white room like a “blank canvas” for the children to colour. When the exhibit first went up, everything was white. Then, of course, it became much more colourful. More and more dots were added by the children until nearly every part of the room was covered in colour. The exhibit will be at the Australian art gallery until March. Yayoi Kusama only asked children to participate in her art work. Why do you think she only wanted children to decorate the white room? Today’s article includes two wonderful images. How do these pictures help you understand and imagine Kusama’s art? complex texts (OME, Reading: 1.3). Given that today’s story is all about dots, let’s take a closer look at periods. Periods are punctuation marks that are placed at the end of a sentence (a complete statement). Knowing where periods go is one of the most important that a writer must have. That’s because putting periods in the wrong spots. Confuses readers. The paragraphs below are from today’s story. Place periods where they belong and change the first letter of the next word to a capital in order to make the paragraph grammatically correct. Feeling inspired by Yayoi Kusama? Use different coloured pencils or markers to make each period.